Shivpuri literally translates to the abode of Lord Shiva. Shivpuri houses many ashrams and temples which are dedicated to lord shiva. It is the starting point of the rafting course and is located at a stretch of 16 kilometers from the city of Rishikesh on Badrinath Highway. Come live the thrilling & pulse racing adventure of River-Rafting on the rapids of the Ganges, an adrenaline pumping activity in the midst of a breath-taking scenery of the Shivalik Hills. • Welcome drink on arrival at luxurious resort. 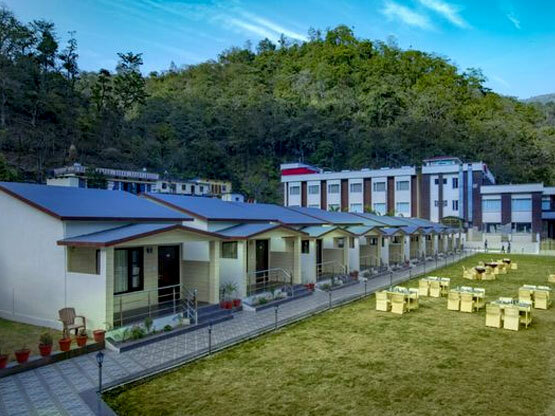 This Resort is on arm of hills and green forest where you can wake with enchanting sound of water of holy river Ganga, twittering of the birds, whispering melodies of trees, the rippling of the stream. • Get ready for a memorable jungle trek to the magnificent Neerghar waterfall. After spending a wonderful time near the waterfall, back to the resort. • Enjoy the scrumptious lunch and then spend some relaxing time by exploring the area. Nature walk along the Ganga beaches. A cool swim in resort's swimming pool. • In the evening, enjoy a hot cup of tea/ coffee with delicious snacks. • Dinner veg/ non veg and relaxing overnight stay at the resort. • Lunch at the Restaurant of the resort after rafting.